The black line/dots are the 12 month moving average, as you can see we will soon hit 410 as the 'average' ppmv. This is your annual rate of increase graph, the horizontal black bars are the ten year moving average rate for each set depicted. Most of the growth in CO2 emissions is thought to come from gasoline used in increasing car, bus and plane travel around the globe. Coal use is slightly below a peak set in 2013, but is increasing and will likely reach new highs in the next few years. Plantagenet wrote: Most of the growth in CO2 emissions is thought to come from gasoline used in increasing car, bus and plane travel around the globe. You'd know about that one, wouldn't you? Thanks for the graphs, T.
Yeah, that's more bad news, P.
Travel now exceeds electric generation for total emissions globally, as I recall. Just for comparison here is a post from 16 months ago when we were peaking at 409 ppmv. For some perspective, Gavin Schmidt at RealClimate claims that an 80% reduction in emissions is needed just to stabilize atmospheric CO2 levels (though heat would continue to increase for a while).
" There's so much CO2 in the atmosphere that planting trees can no longer save us"
January officially came in at 410.83 ppm on NOAA. That's a growth rate of 2.87 ppm over 2018. The running 12-month growth rate is back up to ~2.10 ppm. If it is not clear, these CO2 annual increases are very large. The whole 100,000 year glaciation cycle involves a variation from 180 ppmv to 320 ppmv (at most) which is 140/100000 = 0.0014 ppmv/year. 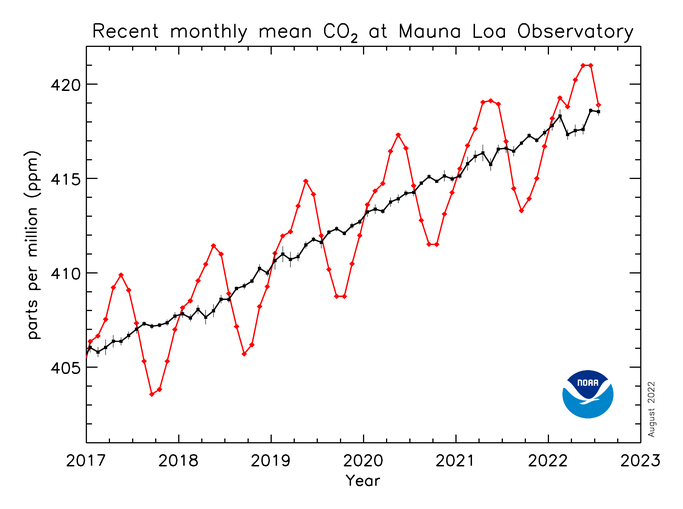 Note that the peak variation is during the collapse of CO2 to under 200 ppmv which happens in a very short period compared to the build up (hence the saw-tooth pattern). We should be experiencing a relatively rapid collapse in CO2 being in an inter-glacial period and not a rapid increase. This is a systematic pattern in the observations. Where are the deniers and their variability excuse? 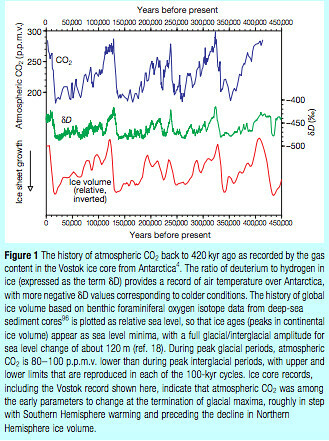 The concentration of carbon dioxide (CO2) in the atmosphere has varied in step with glacial/interglacial cycles3,4 (Fig. 1). During interglacial times, such as the Holocene (roughly the past 10,000 years), the atmospheric partial pressure of CO2 (pCO2 ) is typically near 280 parts per million by volume (p.p.m.v.). During peak glacial times, such as the Last Glacial Maximum about 18,000 years ago, atmospheric pCO2 is 180±200 p.p.m.v., or roughly 80±100 p.p.m.v. lower. Note the ice volume in this diagram is inverted and what it shows is that lowest ice volume corresponds to the highest CO2. Or at least that's the way I read it. 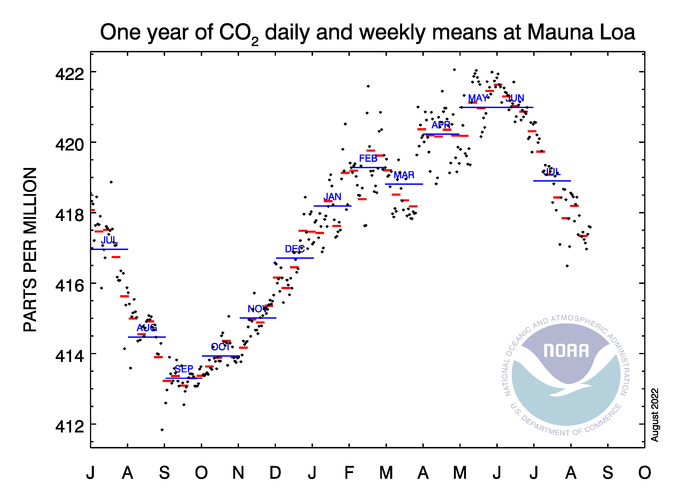 There is a lot of volatility recently in the Mauna Loa numbers, but the underlying trend is very worrying. With no significant difference in ENSO level year over year, we are seeing 3+ ppm changes year over year. Even looking at the global CO2 estimate for 2018 vs 2017, it is 2.63 (based on the November numbers, will be revised as December to February come in). When taking into account methane etc. 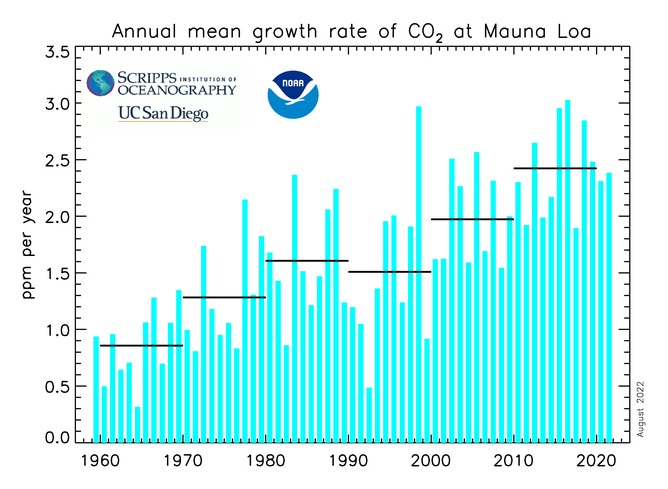 the annual change is around 5ppm CO2e. I remember reading that average annual numbers between 2.5 and 3 would be a symptom of increasing carbon cycle feedbacks (reduction in sinks and/or increase in natural sources). Seems we may be at the beginning of this, which would mean that the rate of increase in atmospheric concentrations will continue to increase, even if emissions stabilize. If this is happening at just over 1 degree centigrade, once again Jim Hansen will have been prove correct. The rest of science will take its usual time to catch up. And…we're off to the races! If I calculate correctly, the average yearly rise was ~ 2.5 ppm between Feb 2009 and Feb 2019. The actual yearly rise is higher for many weeks now. Last week the difference grew to almost 4 ppm, and we do not have an El Niño yet. Where will this end? This should surprise nobody. in the last decade China has added on the order of 100 million ICE vehicles to its roads in addition to quadrupling the number of coal burning electric power stations. At the same time India is on a coal fueled electric power station boom just a few years behind China. Next up are Indonesia and Pakistan. The developing world is not going to stop burning coal because certain EU and North American elitists tell them they must, while at the same time happily burning much of their own.